Welcome once again to the monster anniversary! Today's monster, the cavern pseudoscorpion, is one of those monsters that is hidden and better left uncovered. When PCs are involved, though, that's just never likely to happen. It's not terribly great in melee against flyers, but it makes up for it with its sticky acid breath weapons which threatens to knock them out of the sky. I hope you enjoy the cavern pseudoscorpion, and I'll see you tomorrow with monster #20! This gigantic orange scorpion-like creature has oversized mandibles, long pincer claws, and a stinger that ends in a metallic needle. Speed 50 ft., burrow 40 ft., climb 40 ft.
Bioluminescent (Ex) A cavern pseudoscorpion’s carapace gives off light equivalent to a torch. This luminescence lasts for an hour after the scorpion’s death, but a successful DC 20 Knowledge (nature) or Survival check allows a character to preserve this luminescence for 24 hours. Deflecting Carapace (Ex) If a cavern pseudoscorpion is targeted by a spell or effect that affects a line and fails its Reflex save or halves the effect on a successful Reflex save, it is affected by the spell or effect as normal and reflects the line in a random direction. It has a 50% chance to bounce the line back to its origin; otherwise, the line bounces in a random direction as per a miss with a splash weapon. The line terminates after it has travelled a total distance per the spell or effect (so, a reflected line may not make it back to its origin). 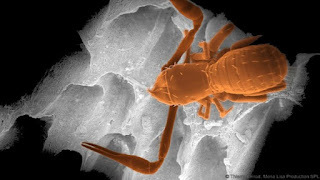 Impale (Ex) If a cavern pseudoscorpion confirms a critical hit with its tail attack against a creature smaller than itself, the spike-tipped tail impales the target creature. An impaled creature gains the pinned condition (though the scorpion doesn’t gain the grappled condition), takes 2d6 points of bleed damage, and automatically takes damage from the scorpion’s tail each round it remains pinned. The scorpion cannot constrict a creature it has impaled, nor can it use its tail attack while it is impaling a creature, but it doesn’t need to succeed at a grapple combat maneuver check to maintain the grapple. A cavern pseudoscorpion can release an impaled creature as a free action. Sticky Acid (Ex) If a creature takes damage from a pseudoscorpion’s breath weapon, the acid sticks to the creature. At the beginning of the creature’s turn, it takes an additional 4d8 points of acid damage, and gains the grappled condition. The sticky acid lasts for 6 rounds or until a creature breaks free of the substance (as if breaking a grapple, using the breath weapon’s save DC + 10 as the CMD). A flying creature trapped in the sticky acid cannot fly and falls 60 feet per round. Cavern pseudoscorpions are primordial vermin which previous generations locked away in inaccessible underground caverns, where the scorpions fed on whatever creatures blundered into their lairs. For the most part, the scorpions went into a dormant state due to lack of food and stubbornly stayed alive as they waited for their hunting grounds to reopen. With civilization spreading and exploring these formerly forbidden areas, the vermin have escaped and gone on rampages before returning to the relative safety of their homes deep underground. Despite their mindlessness, cavern pseudoscorpions seem to harbor a hatred for flying opponents and target them with acidic breath weapon, spewing a tarry substance that sticks to its victims and renders them incapable of flight while burning them further until the substance becomes brittle and sloughs off. The scorpions also possess a tough chitinous shell which protects them from most elemental attacks, allowing them to take on all but the most powerful dragons. A typical cavern pseudoscorpion stands 15 feet tall, measures 28 feet in length, and weighs 2 tons.